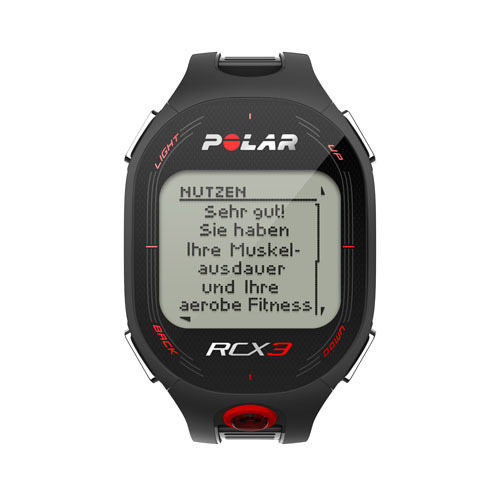 The new RCX3 is ideal for recreational runners and cyclists who wish to prepare a simple exercise instructions on the next event. The OwnCal® program displays the calories and measuring the percentage of fat burned. And with OwnIndex® you can track how your fitness improves with training. The OwnIndex® is comparable to the value of the maximum oxygen uptake capacity. This is normally possible only with extensive investigations. With the OwnIndex® fitness test the heart and blood vessels in question performance can be determine in a relaxed resting state. The values are based on personal data so that it shows whether you have improved your fitness. In addition, the OwnIndex ® is scientifically recognized. The OwnCal® program is a calorie measurement. It will be shown during the training and the value of the total consumption of all units. In addition, a display of the fat-burning percentage is present. The zone Optimizer helps to train in the right intensity. It fits your personal heart rate zones based on your current fitness level for each workout. No matter what situation you are conditional, with the Optimizer zone they are always training in the perfect intensity. With the Polar sport zones you will succeed during exercise training intensity control. In addition, with the help of the Polar training programs based on the sport zones can be trained. This function displays the total training load on polarpersonaltrainer.com and informs you about your state of recovery. So you are always up to date and can be oriented so. The Running Index rates your performance. Using your heart rate and running speed, your aerobic fitness and running efficiency to be determined. If there is an improvement of running efficiency, this means improved mileage. 1x Polar WearLink®+ transmitter W.I.N.D.